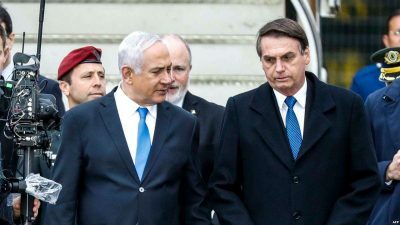 Prime Minister Netanyahu welcomed Bolsonaro to Israel during his first official visit, hoping the support of the right-wing Brazilian can get him re-elected. During his four day visit to the country that has been waging a rocket strike campaign on the Gaza Strip over the past week, Bolsonaro will also meet with President Reuven Rivlin and visit the Yad Vashem Holocaust memorial. He is also set to visit the Home Front Command, the Israeli rescue mission that helped with rescue efforts in Brazil after the collapse of the Brumadinho Dam in January that left at least 206 people dead. Bolsonaro will meet with representatives of the Brazilian community in Israel and the two are expected to discuss bi-lateral agreements. At the Israeli airport Netanyahu praised the Brazilian leader for his “faith in our shared heritage” and his commitment to improving Israeli-Brazilian ties. According to Haaretz, the two will visit a technology innovation exhibition that includes self-driving cars and Bolsonaro may tour an Israeli drone factory whose machines have the capability to conduct facial recognition from high above the ground. “I’m excited to be here. We want to be like you, as is written in the Bible, said the right-wing Brazilian leader who was sworn-in last Jan. 1. “The friendship between our two countries is historic. We must take advantage of the potential of our relations,” he added. Netanyahu is hoping the Bolsonaro visit will boost support from his domestic far-right factions so that they eventually get him re-elected in the nation’s upcoming Knesset, or parliamentary, ballots April 9. The prime minister’s popularity has slipped more as he’s being charged with corruption. The Israeli leader also wants to convince Bolsonaro to follow through with his months-old promise to follow U.S. suite and move the Brazilian embassy to Jerusalem. The move could further shut down a two-state agreement between Israel and Palestine for the time being. Marco Bastos, a political analyst, told Haaretz that the move would please two of Bolsonaro’s major supporters: evangelicals and the Brazilian Jewish community. “The new right in Brazil is trying to imitate the new right in the US. There’s no real strategic interest in moving the embassy,” Bastos said, citing Brazil’s long tradition of friendly relations with nearly all foreign countries. Last week was the first time in several years that the Israeli reserve was called up to control the area at the border with the Gaza Strip and Israel. Fighting between the IDF and Hamas escalated last Monday after a rocket hit a home near Tel Aviv that injured seven people. Netanyahu immediately blamed Hamas for the act and Israel carried out a wave of retaliatory strikes, leaving five Palestinians wounded and killed at least one Palestinian medic at Great March of Return protests. The Palestinian health ministry data shows that four Palestinian medics were killed in 2019 in the West Bank and Gaza by Israeli military fire while performing their jobs. A U.N. report published on Feb. 28 found Israel has likely committed crimes against humanity in Gaza targeted children, health workers, and journalists at the Gaza protests. “We are ready for every scenario and, if needed, for a broader campaign. We will do what is needed for Israel’s security,” Netanyahu said to his Brazilian counterpart.